The Wandle Trust is embarking on an exciting new project to research and understand the source of the river and how it has moved over time. 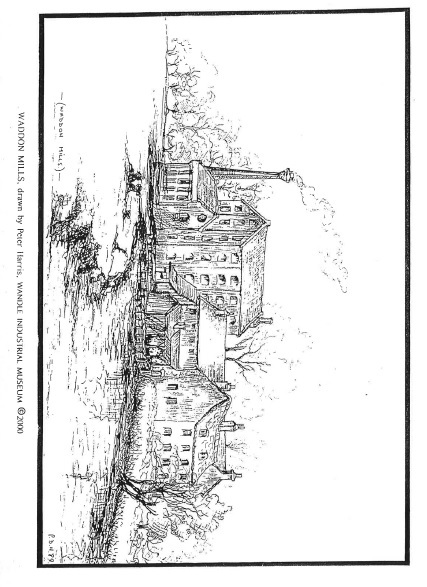 What is the source of the Wandle? The source of the River Wandle is found where two rocks – chalk and clay – meet. This occurs in our local area along an east to west to line starting in Croydon, going through Wallington and Carshalton to Esher. 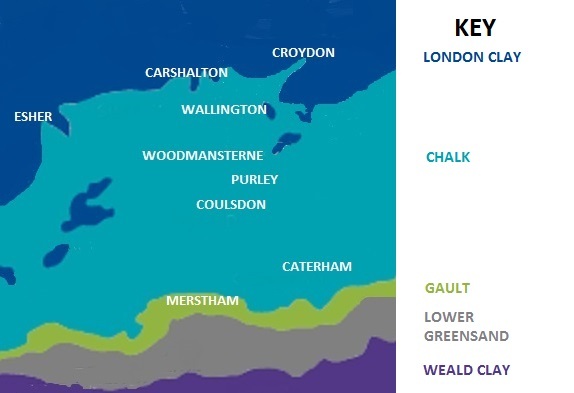 Chalk makes up the North Downs, shown in light blue on our simplified map. 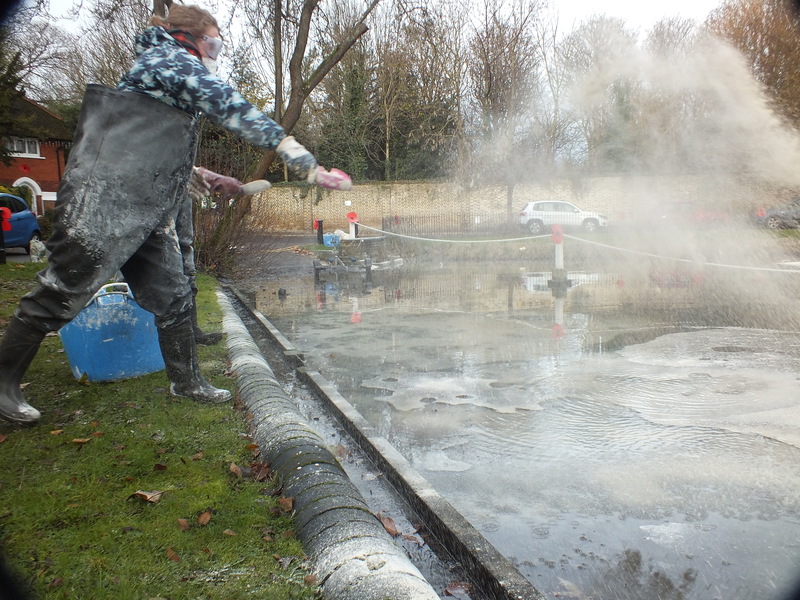 Chalk has the capacity to allow water to flow through it so when rain falls it soaks into the rock as if it’s a sponge. As a result the water builds up within the chalk to create huge underground reservoirs called aquifers. Overlaying the chalk is clay – shown in dark blue on our simplified map. Unlike chalk, clay does not allow water to flow through it. As a result rainfall flows across the surface of the clay rather than flowing down in to it. Our east-west line marks where the chalk and the clay meet. Along this line any water held in the chalk aquifer is forced to come to the surface, creating the spring sources we know and love on the Wandle. How does the source of a river move? 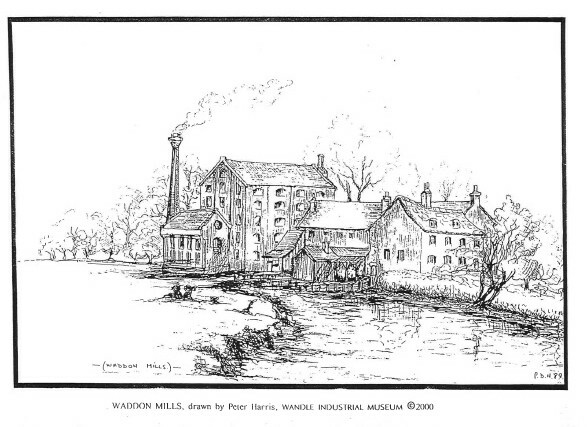 The sources of the River Wandle has changed its position over time. One theory suggests that the River Wandle once started near the village of Merstham in Surrey (south of the M25!) but was ‘captured’ by the River Mole. This is going back to the time when the climate was a lot colder than it is today – back in the Ice Age when mammoths were strolling around your back garden. 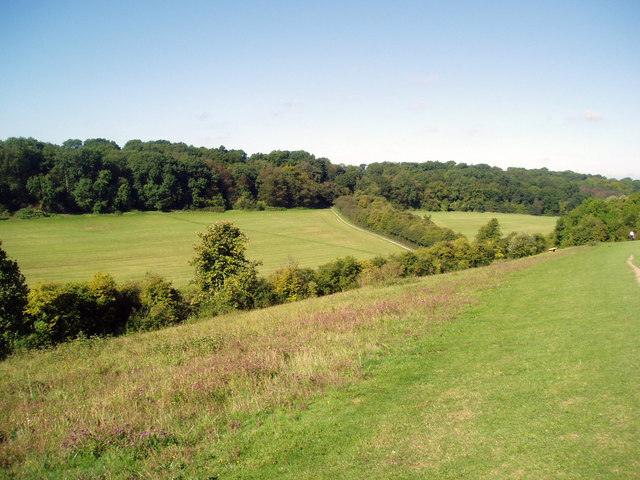 We do know from the shape of the North Downs – (the hills that now separate Merstham from Carshalton and Croydon) – that they have been shaped by water action. Look at the ‘dry valleys’ around Woodmansterne, Coulsdon and Caterham. Imagine where we live today looking more like the Alaskan tundra – sub-zero temperatures, freezing cold arctic winds and most importantly frozen ground. The chalk, which today allows water to flow through it, was then permanently frozen (called permafrost). When snow and ice melted in the summer, the rocks and soil could not allow the water to flow down through them. The water flowed across the land surface instead, and eroded the ‘dry valleys’ we can still see today. But the story doesn’t end there – because we’re all still having an effect on the position of the Wandle’s spring line. People use water. Where does our water come from? From those underground aquifers of water caught inside the chalk. As there are now more and more people using more and more water, it is being taken out of those underground reserves. What happens next? Instead of water bubbling out all along our west-east line in many places the springs have simply dried up as water is ‘over abstracted’ from the underground aquifer. People have also built houses, roads and factories. As a result our east-west line has disappeared under concrete – the river is now flowing underground under all this stuff. 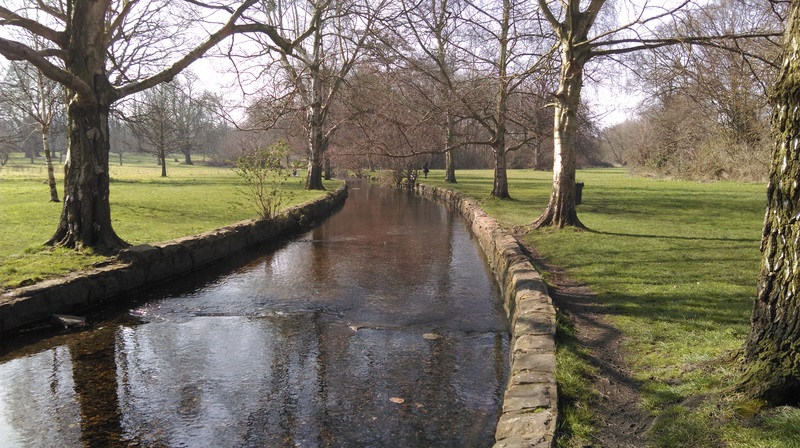 Go to Wandle Park in Croydon and you can see efforts to bring the River Wandle back to the surface where it was previously culverted under the park. So we know that the source of the River Wandle has changed over time, and is still continuing to change – some of these changes are natural (ice age, permafrost, mammoths) whilst others are not (abstraction and concrete). Will it change in the future? Who knows? Very likely, some would say – our population of people is likely to increase, so we’re going to need more houses and roads and need more water. We think too that the climate is changing – what impact will this bring to the source of our local river? 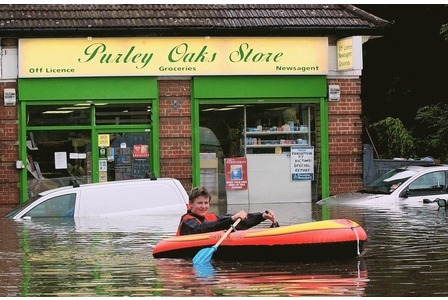 Who remembers the floods in Purley back in 2014? Is this a sign of the future? 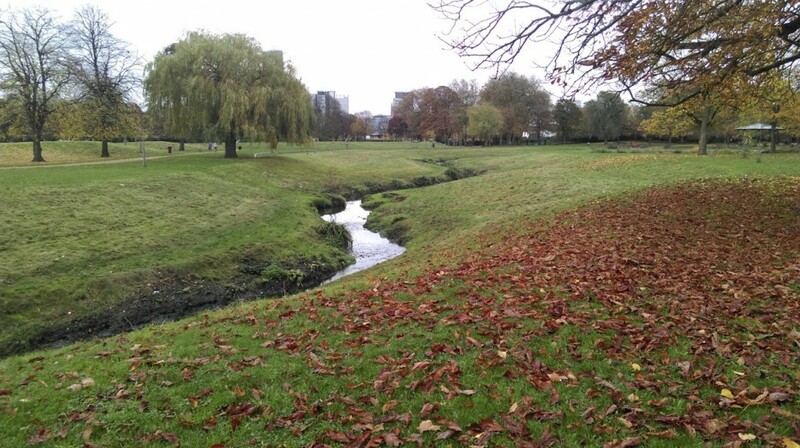 The Wandle Trust will work with local volunteers to research the source of the River Wandle and how it has changed over time – this will include using archived material, geological maps, photographic evidence and oral histories. The project will use resources in libraries and other local sources. Contact Project Officer David Gill to show your interest. Let him know your particular areas of interest and any areas of relevant skills and knowledge you might possess. David can be contacted at david.gill@wandletrust.org or you can call his mobile on 07468 529 312. The project is funded through the Living Wandle Landscape Partnership, a Heritage Lottery Funded scheme aims to bring people closer to their local river. This entry was posted in Uncategorized and tagged Croydon, Education, Living Wandle Landscape Partnership, People, Research, Source, Spreading the Wandle Word, Sutton, Volunteer, Wandle on November 9, 2016 by Polly. 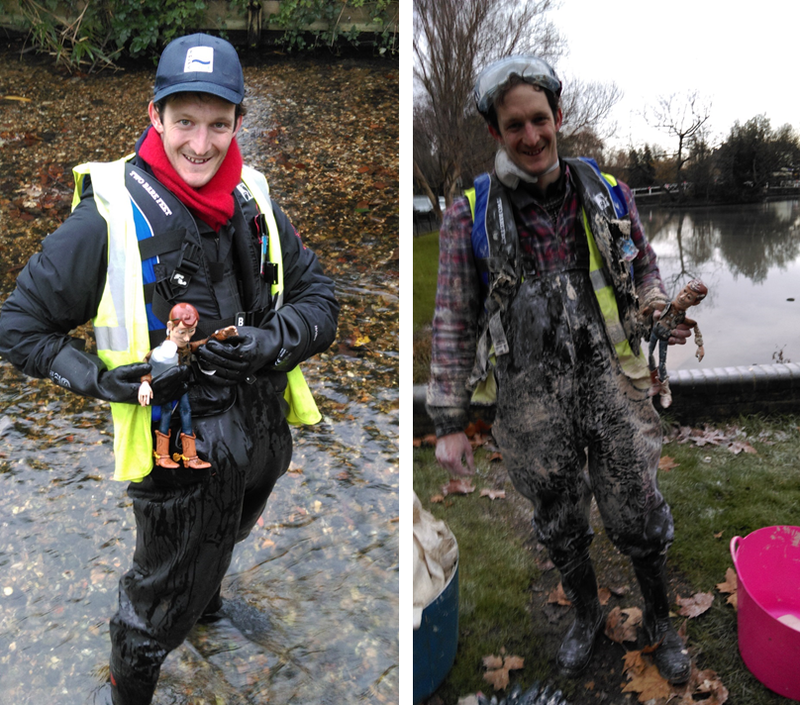 Our Water Quality Officer, Olly, has been having a busy few months working to tackle urban diffuse pollution on the River Wandle. If you missed the introduction to his work – have a quick read now! This week, Olly, myself and some lucky volunteers will be installing the next pollution mitigation measure: Mycofilters. Mycofilters (Mycos for short) are mesh sacks packed full of straw, wood chip and mycelia (the non-fruiting part of fungi). Over time the mushroom mycelia grow throughout the sack and create an expert filtration device. Once placed in the river, the mycelia filter out contaminants from the water which passes through them. The Wandle Trust has already trialled growing and installing these filters. In November 2014, we held another successful volunteer day to make a further 60 bags with a slightly modified and more robust design. This week we will be taking these fully grown Mycos and installing them on sites where pipes are potentially polluting the river. The Mycos will be installed securely to ensure there is no flood risk and will be monitored carefully over the next two months to determine their effectiveness. So if you spot something odd looking close to the river – it is probably a Myco! Please don’t remove them and if you see one in jeopardy – let us know! A BIG thank you to our Myco-making volunteers from November. Thanks to you we managed to make 6 Mycos in less than four hours! I’d also like to thank our sewing team who took the time to sew up 60 bags for us to stuff full of pollution busting goodness. This entry was posted in Uncategorized and tagged Environment Agency, Events, Mycofiltration, Mycos, Pollution, Pollution monitoring, Research, South East Rivers Trust, Thank you, Urban Pollution, Volunteer, Wandle on January 14, 2015 by Polly. The ponds have turned a milky-white colour. But do not fear, this was intentional! 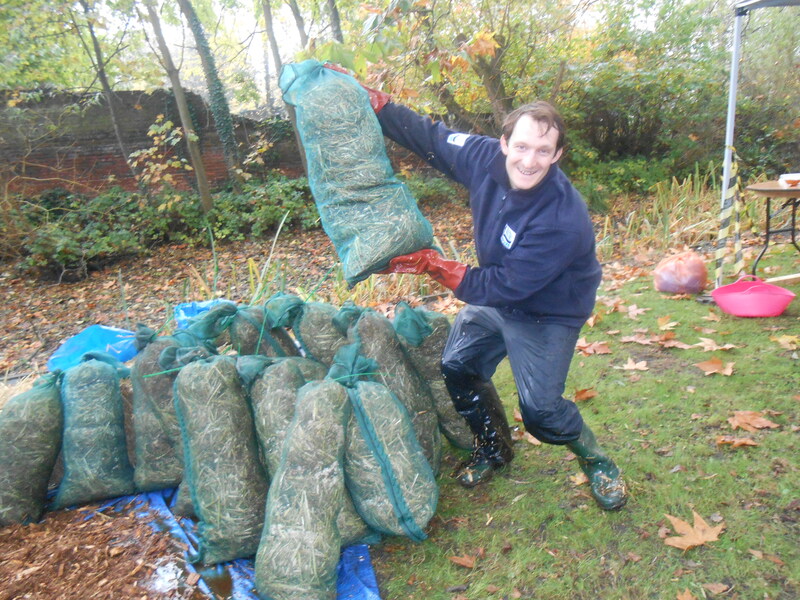 Working with the Environment Agency, we have just added two tonnes of Siltex to the ponds. 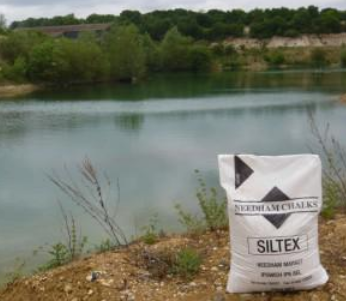 Siltex is a natural chalk-like substance which helps to increase the speed of silt breakdown by stimulating natural processes. 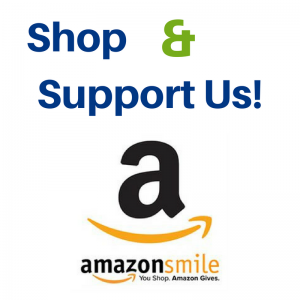 (Click here to read more about why we are doing this). We had eight dedicated and brave volunteers join us at 8am on chilly Tuesday morning. 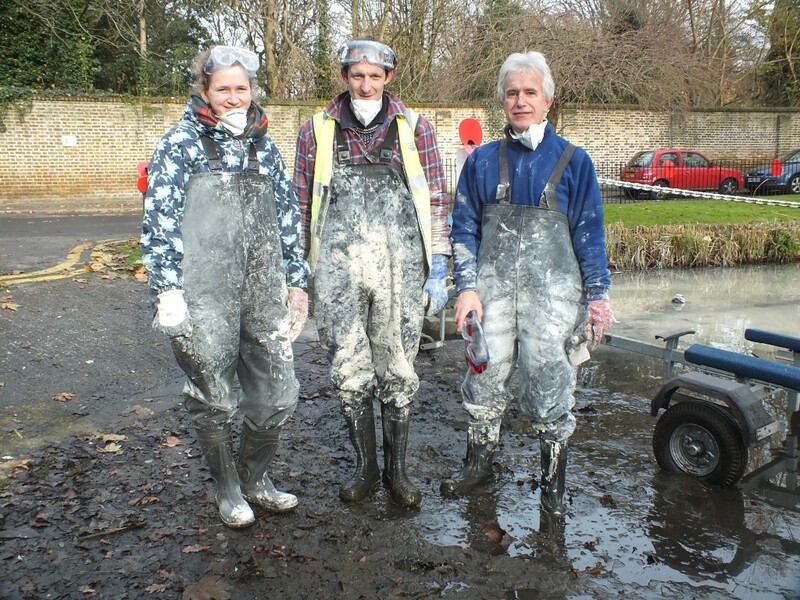 Everyone was kitted out with waders, goggles and masks – Siltex isn’t dangerous but we wanted to be extra careful. Steve stepped up as Captain Siltex to join Olly in the boat, throwing Siltex overboard in the deeper waters. For the morning, our vessel was kindly lent to us by Sutton Council. 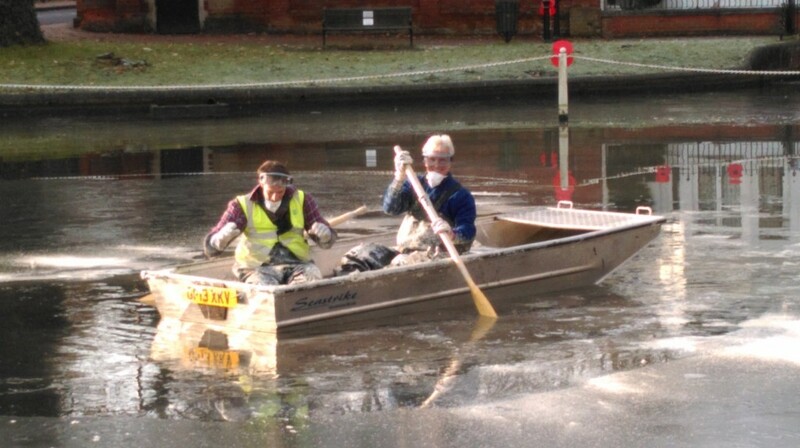 In the afternoon, Olly and Steve commandeered a smaller boat from the Sutton Ecology Centre. Without these boats, we wouldn’t have been able to apply the Siltex at all so we are extremely grateful to Dave Warburton, Ian Hudson, Warren Chapman, Collin Franklin and Mark Featherstone for loaning and delivering these boats on the day. While Steve and Olly sailed the open seas, the rest of us were adding Siltex from the shore, showing off our throwing skills. This allowed us to get a good coverage over the shallower parts the boats could not access. Throughout the day, the Environment Agency were taking readings further downstream to ensure everything was working as it should. 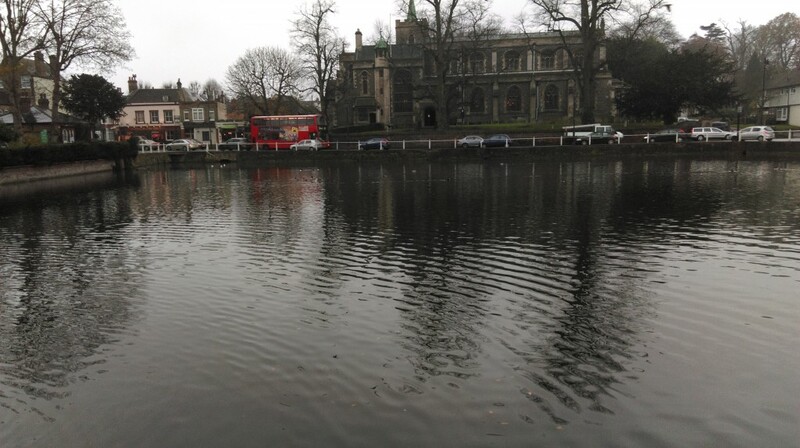 Olly will be monitoring this regularly for the next few months to determine if it is a cost effective solution to the management of silt at Carshalton Ponds. Last week, Olly and I took some pre-Siltex water samples on a chilly and damp morning. Why are there four different bottles I hear you ask? The reason for this is that there are several different substances which are of interest in the ponds. We are interested in what effect the Siltex might have in speeding up the breakdown of several contaminants (e.g. car exhaust particles) as well as reducing the overall volume of mud. Different tests are required for different substances – for instance hydrocarbons (oils and fuels) stick to plastic, so must be stored in a glass bottle if they are to be extracted and analysed. So different bottles are needed for each different test! While we were out we rescued Woody from the Wandle – he is now our unofficial Mascot for the project! He even joined us for the Siltex event, although came out a little worse for wear…. This entry was posted in Uncategorized and tagged Environment Agency, Events, Pollution, Pollution monitoring, Research, River restoration, Siltex, South East Rivers Trust, Thank you, Urban runoff, Wandle on December 10, 2014 by Polly. In a highly developed landscape such as Greater London, urban ponds can provide an important haven for wildlife and therefore it is important to keep the waters happy and healthy. Unfortunately over time urban ponds tend to fill up with sediment washed from the surrounding area such as leaf litter and bird droppings. Have you ever been for a walk along the Wandle to Carshalton? If you have, you will have undoubtedly seen a mass gathering of wildfowl at the ponds. These high densities of geese and ducks can be a particular problem with their droppings increasing the organic content of the ponds, resulting in algae blooms and a deterioration in the water quality. The Wandle Trust are trialling Siltex in Carshalton Ponds as a potential solution to the surplus of silt. Siltex is a natural chalk-like substance which helps to increase the speed of silt breakdown by stimulating natural processes. It is environmentally friendly and is harmless to plants and animals. 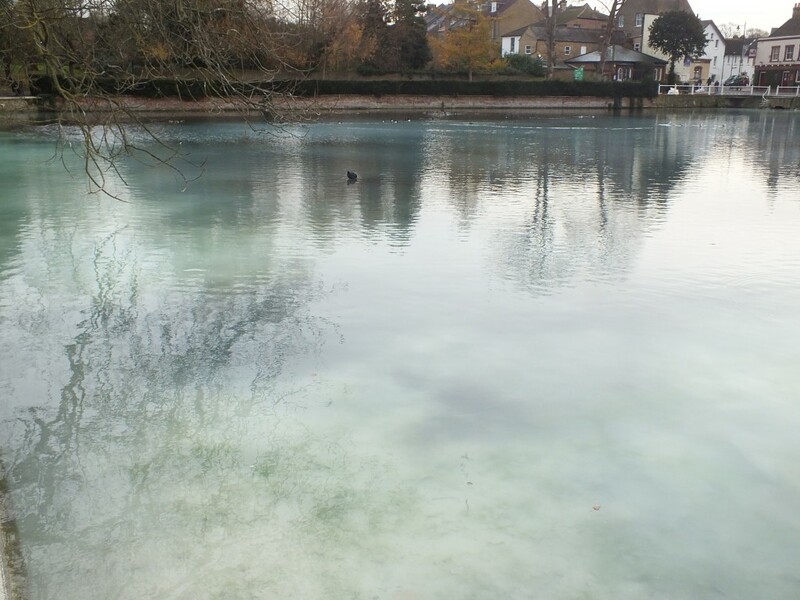 In the next week, we will be applying the Siltex powder to the mud in Carshalton Ponds. 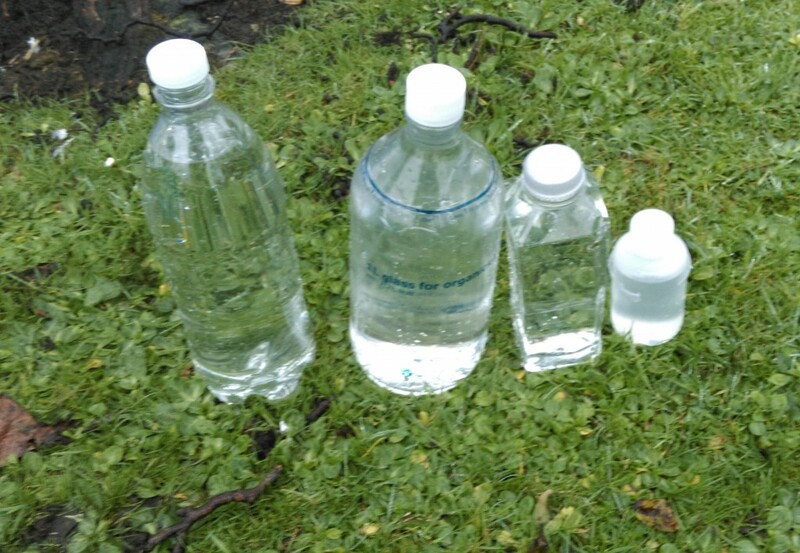 The effects of Siltex will then be monitored closely over the next few months by our staff to determine the effectiveness of the measure and its effects on water quality. We will of course keep you updated with our news – so keep your eyes out for more Siltex blogs. 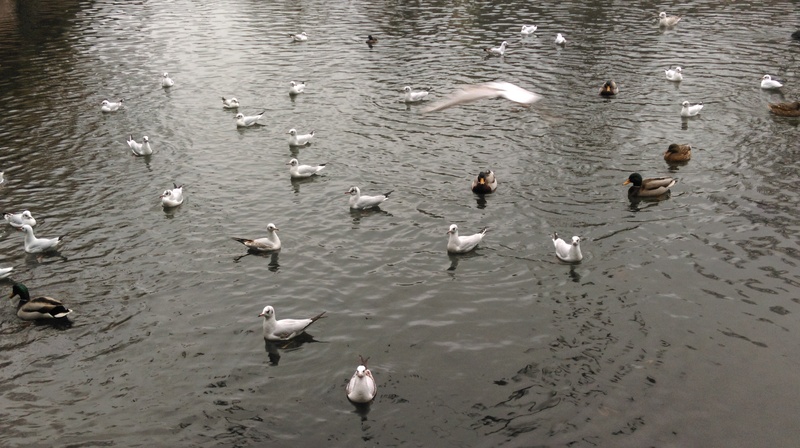 This entry was posted in Uncategorized and tagged Carshalton, Pollution, Pollution monitoring, Research, Urban runoff, Wandle, Wandle Catchment Plan, Water birds, Water quality on December 6, 2014 by Olly. Over the last 2 years, the Wandle Trust has been intensifying efforts to tackle the considerable problem of pollution in the river. Often contamination can be tackled by our partners in the Environment Agency, tracking down pollution to the source. However, this does not work for all sources of contamination. For example, contaminants such as particles from car exhaust, the loss of engine oil and other contaminants from the roads can all be washed into the river from no one “point” source. This is known as diffuse pollution. 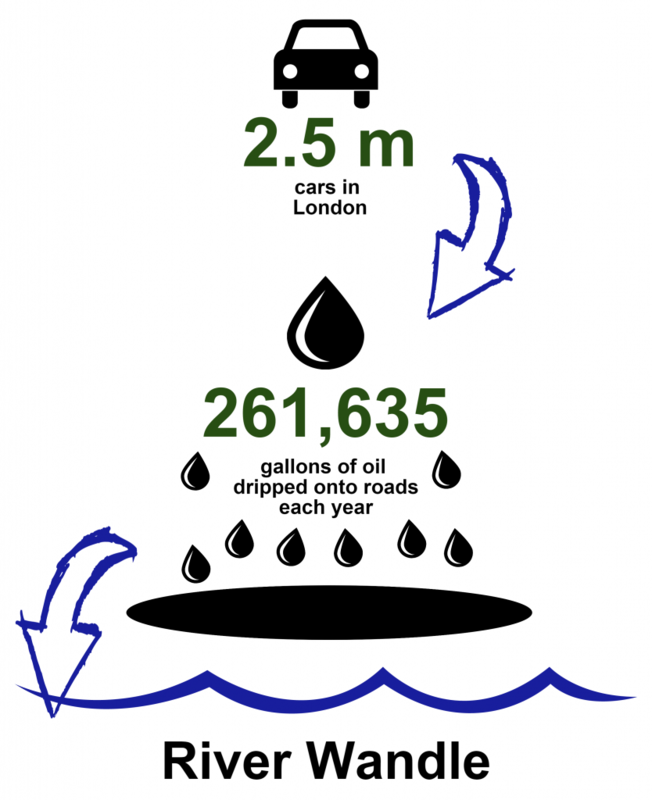 To illustrate this, there are about 2.5 million cars in London, and 16% of them leak oil. It has been calculated that this would equate to 261,635 gallons of oils dripping onto roads every year! Much of this oil will work its way into London’s surface water drains and then the rivers. Although changes to the law and car technology may help one day in the future, we need to start acting now. It has been the Wandle Trust’s mission to find out how the contaminated waters from the surface water drains can be cleaned up before entering our river. This is vitally important because water quality is a major determinant of what wildlife can live in the rivers, how beautiful the rivers are, and how much the community value their local water landscapes. There will be more information about these appearing on our websites in the coming months. We look forward to telling you more about this exciting new phase of our work! This entry was posted in Uncategorized and tagged Pollution, Pollution monitoring, Research, Silt traps, Urban runoff, Wandle, Wandle Catchment Plan, Water birds on December 6, 2014 by Olly. 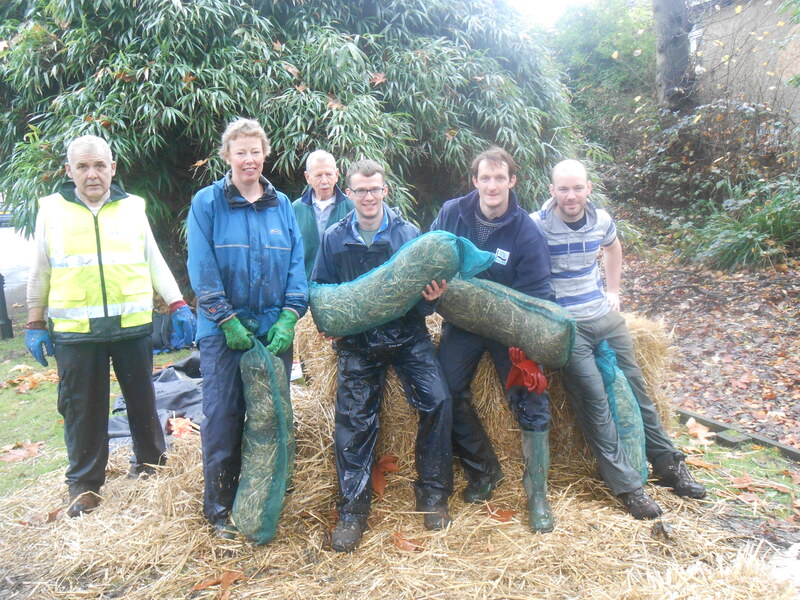 Volunteering on the Wandle: tell us your views! Have you ever taken part in any of the Wandle Trust’s community river cleanups, Himalayan balsam blitzes, Trout in the Classroom or any other events? If so, we’d like to hear what you thought of your volunteering experience – and what you got out of it. Our partners at the Wild Trout Trust and social research company Substance (who also developed the Angling Research and Assynt Angling Research projects, and sometimes even get stuck into our cleanups) have spent the last few months designing a survey around the whole Trout in the Town programme. You may already know that the Wandle Trust’s successful projects formed part of the inspiration for the national Trout in the Town initiative – so we’d love to get as many of our own volunteers’ views as possible. In turn, combined with the results of a second more Wandle-focused survey which we’ll issue for our July cleanup, we hope to hear all your ideas for making the time you generously give to the Wandle Trust even more rewarding. 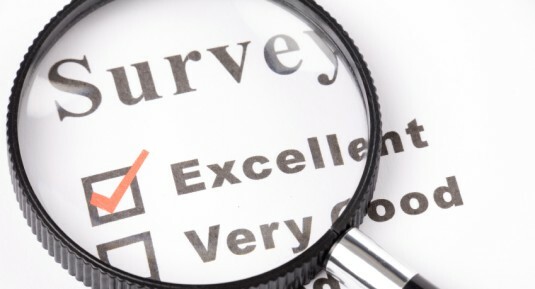 And going forward, these surveys will also help us define the value of the opportunities we offer you and our other volunteers: essential information when it comes to drawing up fundraising bids to continue our groundbreaking projects on the Wandle. You can find the first stage Trout in the Town survey here: it should take just 5 – 10 minutes, and we’d love to hear your views! This entry was posted in Uncategorized and tagged Research, Wandle on June 29, 2010 by Theo.